Our experience has been great so far submitted by Misti C. - Jul 19, 2017 |Recommended: YesWe love living here. It has that beach resort feel but in an everyday setting. We love that there is an over-sized pool that is never to crowded with extended hours for those that work later. It has a gym, game room, business center, candy shop and theater in addition to a very large green space. All of which are great for families. The landscaping is beautiful as are the fountains and buildings. The staff is very nice and on top of anything that needs to be addressed. There is very little noise and the overall feel is great. Great placesubmitted by Carlos A. - Jun 20, 2017 |Recommended: YesIts a great place to live. The apartment is spacious, great conditions, if something is wrong maintenance will fix it quickly 3 days tops. The pool and the game room are amazing. Staff are always nice and happy to help. Fantastic location, excellent amenities, friendly and professional staff, prompt service submitted by David J. - Apr 09, 2017 |Recommended: YesAttractive complex with well kept grounds, large floorplans with awesome kitchens, friendly and quiet community, outstanding location just blocks from the beach, pet friendly plus the owners and groundskeeping seem to do a good job of cleaning up after the pets, pleasant, professional staff and, should an issue arise they have a friendly, competent and prompt service crew. Welcome aboard. 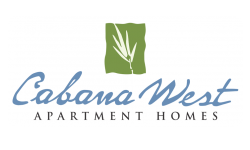 response from property - Apr 05, 2017 Hi Karim, Management at Cabana West truly appreciates your feedback! Please let us know if there is anything we can do for you. Thank you! Love Cabana Westsubmitted by Lakesha R. - May 16, 2016 |Recommended: YesIt's quiet and comfortable with nice apartment features. The property is nice and the available garages help with storage issues. Staff is always helpful.